As you already know, I love to explore this beautiful world and discover some new and unfamiliar places. There’s an opportunity to learn something new and explore almost anywhere. Today I’m going to tell you about my experience in one surreal place – Navagio beach. This is a relatively small beach, surrounded by massive cliffs (I believe around 600ft), located on the majestic island of Zakynthos, Greece. I recently discovered this island and this guide through the fantastic guide to Navagio from Zakynthos Insider, and I fell in love with it at first sight. I planned to visit this island for a long time, and browsed through several guides, but this guide has won me over, and I made my decision. This amazing beach looks so surreal! The sea color is absolutely fantastic to look at. The turquoise blue melds with the deeper blue very realistically, and it all looks amazing. This is by far the most beautiful sea I’ve seen so far in my life. To truly experience this sensation, you got to visit it – you’ll know what am I talking about. ​To reach this cove, you’ll have to either hire a boat or pay for the boat ride. There’s several possibilities to reach this cove, and all are placed on the island’s harbors around the island. Depending on the location, it will cost you from 15 to 20 euros (around $25). 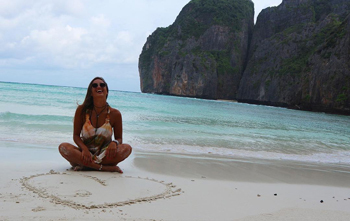 Depending on which boat you go on, you’ll stay on the beach from thirty minutes to more (you can make arrangements with boat captains and stay even more, which I did and I recommend you to do that). 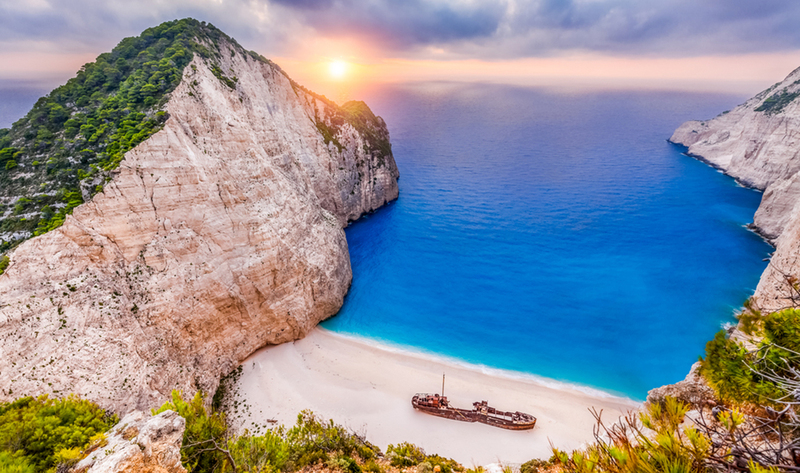 This beach is called “The Shipwreck Beach” for an obvious, huge reason. The big ship was smuggling cigarettes, and the authorities started chasing it. The chase ended in this small cove because the ship run out of fuel. It stands here for more than 30 years and is now a big monument and attraction of Zakynthos. If you come here, you shouldn’t miss Navagio by no means, and should go to experience it from both possible approaches – by boat and by car. When you visit this location by using a car or other type of transportation (quad bikes and vans are popular) you can go to the lookout on top of the rocks that surround it, and enjoy a stunning view that will take your breath away. 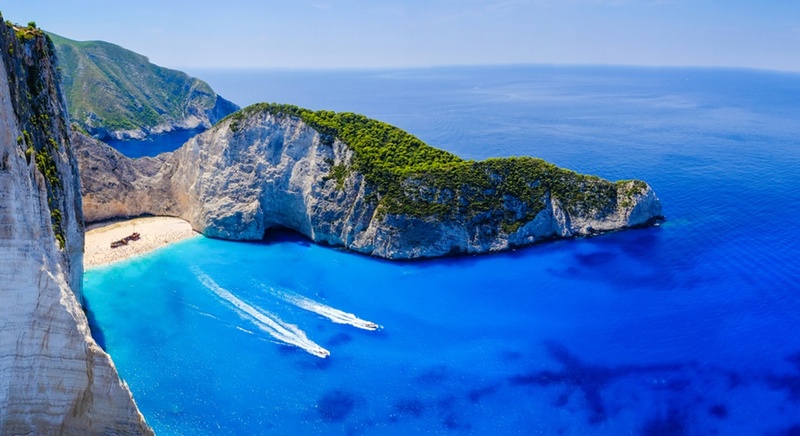 How to experience Navagio Beach the best way? You can choose when and how to visit Navagio, but the best way is to combine the experiences and approaches. You go and experience the beach on the sea level, and enjoy the white sand and pebbles, and combine that with the incredible sea (be careful though, it is crowded, and the water is cold, and pretty deep right from the start of the beach). Then, when the boat brings you back to the harbor (either Porto Vromi or Skinari) you can have a road trip to the beach and arrive at the now familiar location, but from an entirely different perspective. The view from the cliffs is fantastic! You can see people small like ants, and the shipwreck not bigger than your palm from this height. There are several positions you can take on the cliffs for fantastic views, but only one is 100% secured and recommended. That’s the marked spot for sightseeing, with security fence and warning. On the other hand, there are several more possibilities to experience Navagio from above, if you have an adventurous spirit. There are several paths around the first sightseeing site, guiding you through rock formations and quite demanding areas (especially if you’re in flip-flops), so be careful when walking on these trails. If you decide to do so, you will be rewarded with the astonishing views from different angles, and breath taking experience. I decided to try one of the paths, and it was really an experience you can’t describe enough with mere words. It’s simply that mesmerizing and astonishing. You just have to see for yourself. I haven’t gone too far up right, as you can see on the map, but I believe it is even better there. It gets quite demanding, and it’s recommended to have hiking shoes while going that way. On the other hand, you’re going there at your own risk; the cliffs are ridiculously high, and there’s almost no chance of survival if you fall off the cliffs. The height is so dramatic that this site is used for base jumping, where brave people use parachutes to land safely before experiencing several seconds of free falling. Check this video and see how intense it can be! It is very important to know that there have been several cases of death by falling from extreme heights on this site, with the most recent one involving a Chinese girl who was blown away by wind while taking the perfect selfie. Please, PLEASE be careful and don’t go near the edge of the rocks especially if you’re going away from the designated area for sightseeing. On the top of the cliffs, you can stay as much as you’d like, which is a big difference when we talk about the timing and the eventual finalization of the experience. Yup, I’m talking about the sunset. The experience is absolutely fantastic, and you’ll have to witness it to know what I’m talking about. 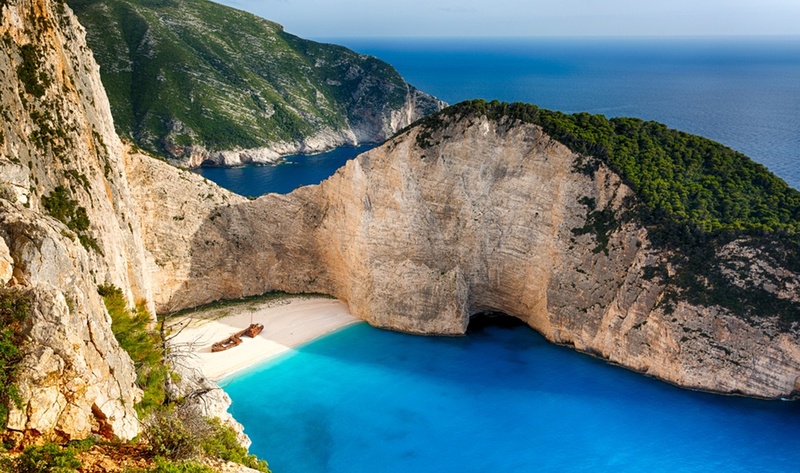 So, if you ever get a chance to go to Zakynthos island in Greece, make sure to visit this wonder of nature. It will be the highlight of your vacation, and you’ll going to love it!